François Rabelais (c. 1494 - April 9, 1553) was a major French Renaissance writer best-known for Gargantua and Pantagruel and his relation to the grotesque. Mikhail Bakhtin, the Russian philosopher and critic, derived his concept of the carnivalesque and grotesque body from the world and work of Rabelais. Although the place (or date) of his birth is not reliably documented, it is probable that François Rabelais was born in 1494 near Chinon, Indre-et-Loire, where his father worked as a lawyer. La Devinière in Seuilly, Indre-et-Loire, is the name of the estate that claims to be the writer's birthplace and houses a Rabelais museum. Later he left the monastery to study at the University of Poitiers and University of Montpellier. In 1532, he moved to Lyon, one of the intellectual centres of France, and not only practised medicine, but edited Latin works for the printer Sebastian Gryphius. As a doctor, he used his spare time to write and publish humorous pamphlets which were critical of established authority and stressed his own perception of individual liberty. His revolutionary works, although satirical, revealed an astute observer of the social and political events unfolding during the first half of the sixteenth century. Using the pseudonym Alcofribas Nasier (an anagram of François Rabelais minus the cedilla on the c), in 1532 he published his first book, Pantagruel, that would be the start of his Gargantua series. In this book, Rabelais sings the praises of the wines from his hometown of Chinon through vivid descriptions of the eat, drink and be merry lifestyle of the main character, the giant Pantagruel and his friends. 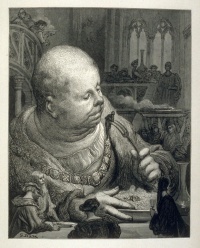 Despite the great popularity of his book, both it and his prequel book on the life of Pantagruel's father Gargantua were condemned by the academics at the Sorbonne for their unorthodox ideas and by the Roman Catholic Church for its derision of certain religious practices. Rabelais's third book, published under his own name, was also banned. With support from members of the prominent du Bellay family (especially Jean du Bellay), Rabelais received the approval from King François I to continue to publish his collection. However, after the king's death, Rabelais was frowned upon by the academic elite, and the French Parliament suspended the sale of his fourth book. Hee was born in November,1494. Afterwards, Rabelais travelled frequently to Rome with his friend, Cardinal Jean du Bellay, and lived for a short time in Turin with du Bellay's brother, Guillaume, during which François I was his patron. Rabelais probably spent some time in hiding, threatened by being labeled a heretic. Only the protection of du Bellay saved Rabelais after the condemnation of his novel by the Sorbonne. Rabelais later taught medicine at Montpellier in 1537 and 1538 and, in 1547, became curate of Saint-Christophe-du-Jambet and of Meudon, from which he resigned before his death in Paris in 1553. Gargantua and Pantagruel tells the story of two giants - a father, Gargantua, and his son, Pantagruel - and their adventures, written in an amusing, extravagant, and satirical vein. While the first two books focus on the lives of the two giants, the rest of the series is mostly devoted to the adventures of Pantagruel's friends - such as Panurge, a roguish erudite maverick, and Brother Jean, a bold, voracious and boozing ex-monk - and others on a collective naval journey in search of the Divine Bottle. Even though most chapters are humorous, wildly fantastic and sometimes absurd, a few relatively serious passages have become famous for descriptions of humanistic ideals of the time. In particular, the letter of Gargantua to Pantagruel and the chapters on Gargantua's boyhood present a rather detailed vision of education. It is in the first book where Rabelais writes of the Abbey of Thélème, built by the giant Gargantua. It pokes fun at the monastic institutions, since his abbey has a swimming pool, maid service, and no clocks in sight. Here sojourn day and night. because men that are free, well-born, well-bred, and conversant in honest companies, have naturally an instinct and spur that prompteth them unto virtuous actions, and withdraws them from vice, which is called honour. Those same men, when by base subjection and constraint they are brought under and kept down, turn aside from that noble disposition by which they formerly were inclined to virtue, to shake off and break that bond of servitude wherein they are so tyrannously enslaved; for it is agreeable with the nature of man to long after things forbidden and to desire what is denied us. The French Renaissance was a time of linguistic controversies. Among the issues that were debated by scholars was the question of the origin of language. What was the first language? Is language something that all humans are born with or something that they learn (nature versus nurture) ? Is there some sort of connection between words and the objects they refer to, or are words purely arbitrary? Rabelais deals with these matters, among many others, in his books. 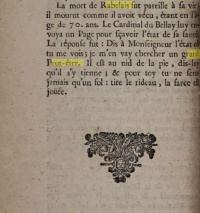 The early 16th century was also a time of innovations and change for the French language, especially in its written form. The first grammar was published in 1530, followed nine years later by the first dictionary. Since spelling was far less codified than it is now, each author used his own orthography. Rabelais himself developed his personal set of rather complex rules. He was a supporter of etymological spelling, i.e. one that reflects the origin of words, and was thus opposed to those who favoured a simplified spelling, one that reflects the actual pronunciation of words. Rabelais' use of his native tongue was astoundingly original, lively, and creative. He introduced dozens of Greek, Latin, and Italian loan-words and direct translations of Greek and Latin compound words and idioms into French. He also used many dialectal forms and invented new words and metaphors, some of which have become part of the standard language and are still used today. Rabelais is arguably one of the authors who have enriched the French language in the most significant way. His works are also known for being filled with sexual double-entendre, dirty jokes and bawdy songs that can still surprise or even shock modern readers. Rabelais has influenced many modern writers and scholars. Jonathan Swift was influenced by Rabelais and Cervantes, and his writing has been compared with theirs. In his novel Tristram Shandy, Laurence Sterne quotes extensively from Rabelais's novels Gargantua and Pantagruel. Anatole France lectured on him in Argentina. John Cowper Powys, D. B. Wyndham Lewis, and Lucien Febvre (one of the founders of the French historical school Annales) wrote books about him. Mikhail Bakhtin, a Russian philosopher and critic, derived his celebrated concept of the carnivalesque and grotesque body from the world of Rabelais. Aleister Crowley's writings heavily borrow from Rabelais themes. Honoré de Balzac was inspired by the works of Rabelais to write Les Cent Contes Drolatiques (The Hundred Humorous Tales). Balzac also pays homage to Rabelais by quoting him in more than twenty novels and the short stories of La Comédie humaine (The Human Comedy). He cites Rabelais in Le Cousin Pons as "the greatest mind of modern humanity". In his story of Zéro, Conte Fantastique published in La Silhouette on 3 October 1830, Balzac even adopted Rabelais's pseudonym (Alcofribas). George Orwell was not an admirer of Rabelais. Writing in 1940, he called him "an exceptionally perverse, morbid writer, a case for psychoanalysis." Milan Kundera, in an article of January 8, 2007 in The New Yorker: "(Rabelais) is, along with Cervantes, the founder of an entire art, the art of the novel." (page 31). He speaks in the highest terms of Rabelais, calling him "the best", along with Flaubert. In Nabokov's novel Pale fire, the poet John Shade states that Rabelais referred to the afterlife as the "grand potato", a pun on Rabelais' famous last words "I go to seek a Great Perhaps". Rabelais was a major reference point for a few main characters (Boozing wayward monks, University Professors, and Assistants) in Robertson Davies's novel The Rebel Angels, part of the The Cornish Trilogy. Unless indicated otherwise, the text in this article is either based on Wikipedia article "François Rabelais" or another language Wikipedia page thereof used under the terms of the GNU Free Documentation License; or on original research by Jahsonic and friends. See Art and Popular Culture's copyright notice. This page was last modified 18:12, 28 November 2018. This page has been accessed 18,316 times.